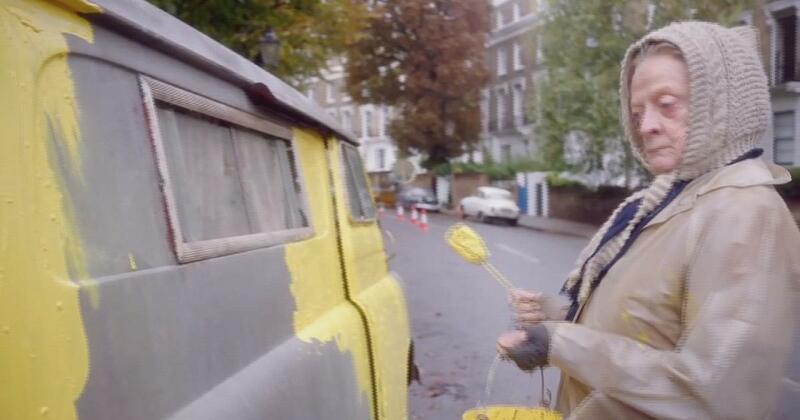 The Lady in the Van is now showing in Australia and is distributed by Sony Pictures. The Lady in the Van tells a story that many will feel they already know and for that reason they will expect more than what they are given with the exception of another natural and superb performance by Maggie Smith. Alan Bennett's semi-autobiographical film's prime focus is Mary Shepherd (portrayed by Smith), an eccentric, frustratingly stubborn elderly woman who lived out of her van in Camden much to the distaste of residents. Alex Jennings portrays a younger version of Bennett himself who allowed Miss Shepherd to park her van in his driveway temporarily. However, temporary turned out to be 15 years. Over this time, the residents came to see Miss Shepherd as part of the neighbourhood rather than an inconvenience, but nobody knew the true story behind the lady in the van. The character of Miss Shepherd will be rather familiar to the majority of people who view The Lady in the Van. Many towns or cities have their own version of Miss Shepherd- a homeless man or woman who is all but part of the scenery. Even though they are often met with distaste and caution due to their appearance and unhygienic practises as a result of their living conditions, it is almost an affection which residents feel for them as they are a part of their neighbourhood. The more fortunate opt to be good Samaritans towards these characters because of their familiarity and feel as though something is missing if they are not about. Also like Miss Shepherd, it is highly likely that these individuals have an intriguing life story which led them to their present situation and these are memories that they very rarely would like to share with anyone. Yet, it is these secrets which make them more intriguing to town residents. 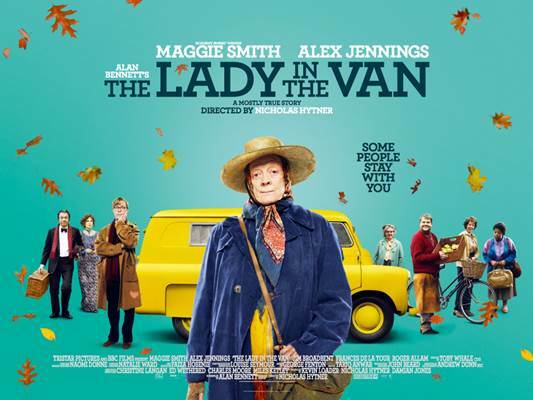 Maggie Smith's performance as Miss Shepherd is the highlight of the film. She perfectly embodies not only her real life counterpart as Bennett writes her, but the essence of anyone in her position. In all her obvious repulsiveness and abrasiveness, it is obvious she has been damaged by the world and remains hostile towards her neighbours out of hurt and anger. Her character has the uncanny ability to make one feel an uneasiness in the same way the residents of Camden do, but like them are also intrigued by her and eager to find out what her story is. Smith's performance is often comical at times, but also tragic. However, despite this sense of familiarity towards the main character and Smith's strong performance, The Lady in the Van's screenplay by Adam Bennett feels most self-indulgent and unsatisfying. It is the details of Miss Shepherd and the mystery surrounding her life that drives the story, but the mixing of this with details of Bennett's life slows it down. Bennett released his book of the same name in 1999 and one can assume without reading the book that it would have flowed a great deal more than the film as it is far easier to coincide two peoples lives in print rather than on screen. Bennett is painted in the film as almost a grand overseer of Miss Shepherd and over-glorifies himself (although he admittedly is a fine writer), especially in the bizarre scenes where he is talking to himself. Scenes such as these are meant to be comical, but the quirky humour will be lost on many. The best pieces of dialogue and amusing scenes which are certain to provoke laughs are reserved for Smith's Miss Shepherd and the all too brief appearance by James Corden. The screenplay also does not do a good job at explaining certain aspects of the story such as how Miss Shepherd has money to travel to the seaside and buy a huge ice-cream sundae and television when she is considered as living in poverty or why she painted all her vehicles bright yellow. Yellow is generally considered a happy, cheerful colour which contradicts who she is. In the book, it reveals that she liked the colour yellow as it is the papal colour. This is not common knowledge that everyone is expected to possess and would have made more sense if it was explained better in the film. Like the book which it is based on, the film gives an unsentimental look at Miss Shepherd. It is commendable that Nicholas Hytner does not attempt to over-dramatize the story by forcing one to feel overwhelming sympathy for Miss Shepherd or make the relationship between her and Bennett something it was not. While this does make the film feel like a better representation of real life, it misses the boat with making one feel any type of emotion. Occasionally Smith's Miss Shepherd will evoke some emotion, but the film seems sucked dry of raw emotion by actively avoiding sentimentality. Again, avoiding this sentimentality does work as far as painting an accurate picture of the true story, but there is also a need when viewing a film about humans to feel something for them. The worst part of the film is that you do feel awe right at the very end, but it is a great disappointment to find out that this scene is one that is 100% fictional. 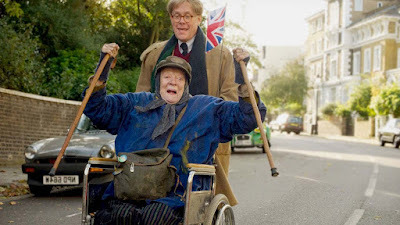 The Lady in the Van is somewhat amusing thanks to the consistently impressive Maggie Smith, but is a disappointing effort from Alan Bennett who has seemed to struggle with putting together an autobiographical screenplay.